When people think of endangered animals, it’s usually the charismatic megafauna that first comes to mind. Folks envision lions and tigers and bears (oh my!). We think of massive herbivores such as elephants and rhinos, or marine mammals such as whales and whale sharks. Of course, many of us may also picture cute animals. People love the more charismatic side of the endangered species group, such as penguins and pandas, which pull at our heartstrings. Rarely do our minds wonder to an endangered dog. But that’s what the Dhole is– a member of the canine family found in Central, South, and Southeast Asia. 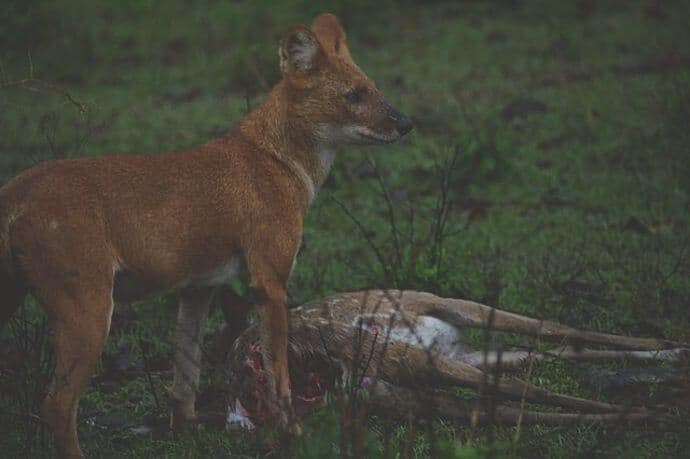 This Asiatic wild dog is extremely endangered, with the IUCN estimating a declining population of less than 2,500 dholes are left in the world. This is one of the many difficult challenges of funding wildlife conservation programs. Animals like the dhole, which don’t wow us with their size or touch our hearts with their cuteness, rarely receive the same amount of attention as, say, the orca. This observation is not meant to take anything away from the importance of movies like Blackfish and The Cove, and the ever-growing movement to rescue and protect the killer whale and dolphins. Those changes to the captive cetacean industry were much needed! But the ideal situation would be that we, as humans, collectively value all of the world’s animals equally. And we should pay particular attention to those animals that are featured on the endangered species list, dhole dogs included. 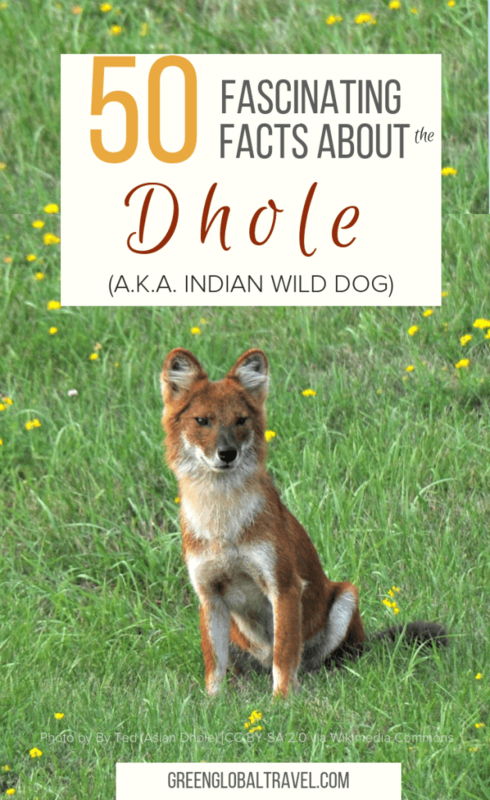 If you’ve never heard of the dhole, stay tuned for a look at what makes it so special. 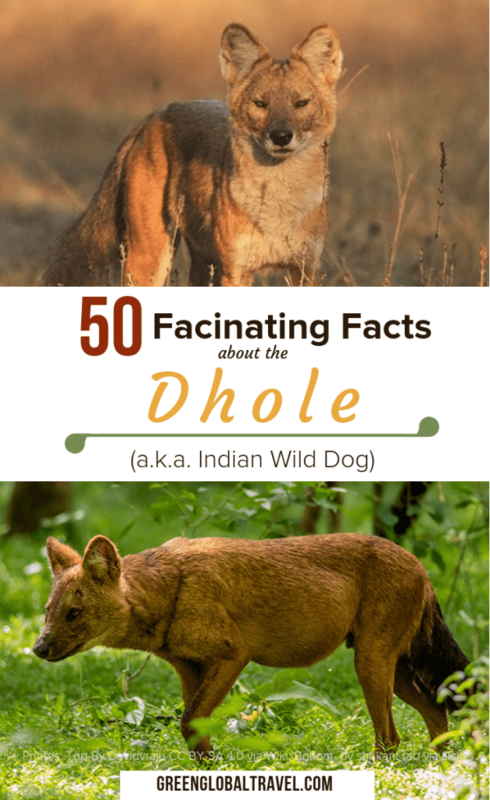 And, if you have heard of it, read on for 50 fascinating facts about this endangered Indian dog. 1) Dholes are officially known by their Latin name, Cuon alpinus. But they also have several other common English names that people use for them, including Asiatic wild dog, Indian wild dog, whistling dog, red dog, and mountain wolf. Of course, there are also different names for this wild Asian dog in the various native languages of its habitat range. 2) From a linguistic standpoint, the plural version of the Indian dog’s name can either be dhole or dholes. This plurality is particularly important because dholes aren’t often rolling solo. They run and hunt in packs, working together as a team to kill animals up to 10 times their size. 3) The dhole is actually the only member of the genus Cuon, but it shares certain physical characteristics with the grey wolf and red fox. 4) According to different sources, there are 10 to 11 different subspecies of dhole. Two are currently listed as endangered by the IUCN, and two others are on the verge. However, in the latest edition of Mammal Species of the World: A Taxonomic and Geographic Reference, only three subspecies are recognized. 5) The most common of these subspecies is the Cuon alpinus dukhunensis, which is found in India. This subspecies is responsible for the dhole’s most frequently used nickname, the Indian wild dog. 6) Unsurprisingly, they’re in the taxonomic family of Canidae. Quite a few members of this family are also found on the endangered species list, including Ethiopian wolves, Mexican gray wolves, red wolves, Darwin’s foxes, island foxes, and African wild dogs (with which the Indian dogs are sometimes confused). 7) Historically speaking, dholes have excelled as survivors. They’ve been hanging around since at least the Pleistocene period, also known as the last Ice Age. That means they originated over 12,000 years ago. These Asiatic wild dogs roamed the planet for millennia without facing much in the way of existential problems. Unfortunately, the 20th century changed that. 8) Eons ago, their natural habitat ranged west from Asia through Europe, and even east into North America. Their range was reduced during the Ice Age to just Central, East, and Southeast Asia, including Mongolia, Russia, and all of China. 9) Today the dhole population is present in around a dozen countries, including Bhutan, southern China, India, Malaysia, Sumatra, Tibet, and throughout Southeast Asia. 10) These animals are highly adaptable to their environment. They generally live in deciduous and evergreen forests, as well as alpine steppes. They are most often spotted in open spaces in the jungle, such as on trails, roads, and along rivers. But they don’t live in plains or deserts. 11) The dhole is generally considered to be a medium-sized dog. They’re somewhat similar in shape to a German Shepard, but they’re considerably smaller. Their trim physique sometimes gets them compared to foxes or even large cats, and they have a similar slinkiness about them. 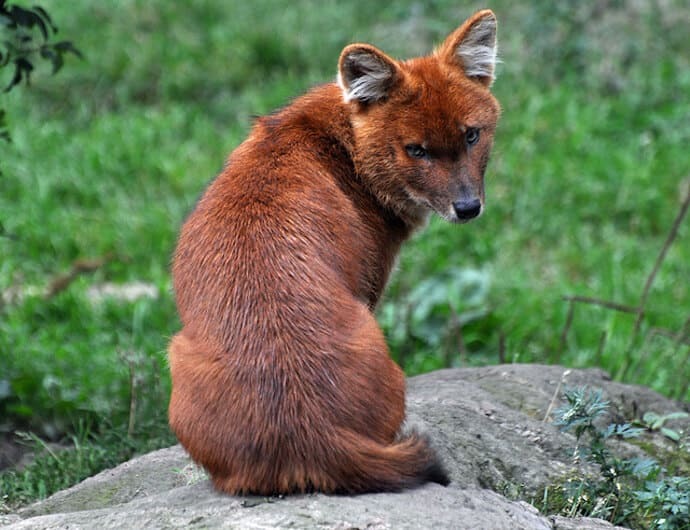 12) Dholes measure about three feet long and 20 inches tall, and their bushy tail adds another foot and a half. 13) Their average weight fluctuates between 25 and 45 pounds, with males typically being more robust than females. Both genders have elongated backbones and spindly limbs. 14) The skull of the Indian dog is unique in the canine world. They have broad heads with noses that are considerably shorter than those of other canine family members. 15) Another unique physical characteristic of the dhole is the fact that their forehead is convex rather than concave. 16) They also have exceptionally strong jaws, which gives the wild dog species a facial appearance more along the lines of a hyena than a wolf or fox. 17) Dholes have teeth unlike those of other species of wild dogs, most of which have 42. The Indian wild dog is missing one pair of lower molars, and their upper molars only have one cusp (as opposed to the two or four that other Canidae species have). 18) The dhole’s teeth give them an impressive shearing action with their bite. This helps the wild dogs to better compete with kleptoparasites (animals that steal captured prey from other animals). 19) Wild dogs in India are characterized by reddish-brown fur with white or light-colored necks, chests, and undersides. Their tails are black and bushy. However, there are different color variations that occur, particularly for those subspecies living in the alpine steppes. 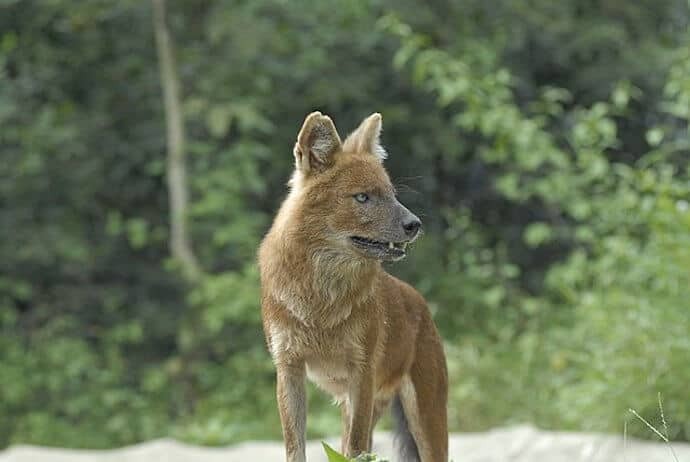 20) Dhole pups are born with dusty brown or black fur, starting to turn red about three months later. 21) Like many other Canidae species, these endangered Indian dogs are very social animals. They tend to live in small groups, which are called clans. These clans are usually small, with between five and 12 members, but they can sometimes number up to 20. Clans of 40 wild dogs have been reported, but this would be a rarity rather than a standard. 22) That being said, clans will sometimes interact favorably with other clans, which could make individual groups appear larger at times. But it’s a pretty rare occurrence. In general, Indian wild dogs maintain rather large territories of 30 square miles or more. 23) Groups of dholes are considered clans as opposed to packs because animals that run in packs always hunt together. Like hyenas, these endangered dogs will frequently split up into smaller groups in order to hunt more efficiently. Three to five hunters is generally the preferred number for catching fawns in the spring. 24) These wild dogs actually have a complex collection of body language for communicating everything from friendliness and playfulness to fear. They often wag their tails when greeting, and they are prone to face-licking. 25) Unlike wolves, dholes aren’t characteristically aggressive with other members of their own pack. But cubs do like to play fight, which helps them to get stronger and prepare for the real battles they’ll face when they’re older. 26) Adult dholes have been known to fight off tigers and leopards, with whom they compete for prey. 27) Although they do not howl or bark, Indian wild dogs have other ways to communicate audibly. They’re particularly vocal, using a series of repetitive whistles that are unique to each individual (hence the “whistling dog” nickname). 28) They can also talk to each other by using a wide variety of clucks and screams. This communication makes them very effective and efficient pack hunters. 29) If you’ve ever seen a wild dog in India, you may know that they have a curious love of water. They’ll sometimes leave their meal in order to get a drink, and after eating they’ll often race to a nearby stream. 30) Dholes seem to love to sit in shallow pools, no matter what the outside temperature may be. 31) One of the reasons the dhole ranks among the most endangered species in India is that every clan has a dominant, monogamous pair. This pair is entrusted with the responsibility of making babies for all of the group’s adults to raise collectively. The dominant pair is often difficult to identify, because dholes don’t display obvious governance like wolves do. 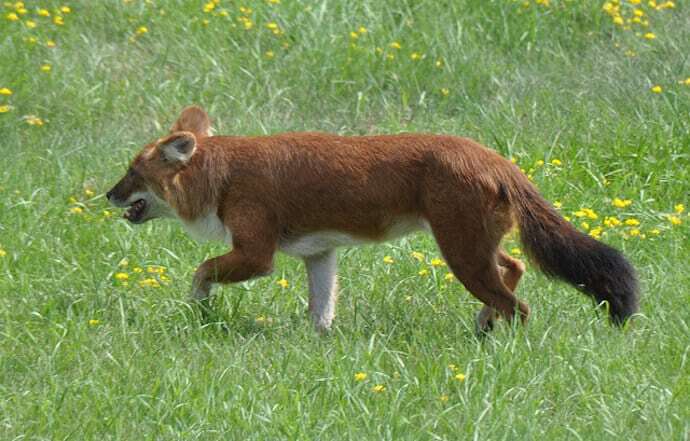 32) Female dhole dogs have a gestation period of two months. They produce litters of around eight pups, which are typically born between November and March. It is believed that they can have litters of up to 16 pups, but this would be a peculiarity. 33) Typically, wild dog mothers set up the den for birthing. The den will more than likely be near streambeds or amongst rocks for protection. Dhole dens may be basic earthen structures with one entrance or multiple entrances. But sometimes clans create a complex web of caverns, which are interconnected with passages. These dens can last for generations. 34) After birth, the mother and her pups are fed by several adult members of the clan. Adult wild dogs will regurgitate food for both the mom and the babies, and the pups can eat in this way after just three weeks. They are often completely weaned off milk at about two months. 35) Both male and female Indian Wild Dogs reach sexual maturity at about one year old. Most begin hunting within a few months. By about 18 months, they’re fully grown. After roughly three years, female dholes are likely to find a new clan to run with. 36) The wild dogs of India are known to have a life span of about 10 years, but they often live closer to 15 years in captivity. These numbers are pretty typical for the Canidae family, particularly with domestic dogs and wolves. 37) Asian wild dogs have very few natural predators. The list is limited to large cats roaming the same hunting grounds, such as tigers and leopards. Yet there are actually fewer breeding adult dholes in the wild than than there are tigers. This makes them one of the most endangered animals in India. 38) As is the case with most endangered species in India, humans are by far the largest threat to the dhole population. Habitat loss due to the expansion of human settlement is a huge issue. 39) Industrial deforestation for businesses such as rubber, timber, mining, palm oil, and paper have left less and less space for this wild dog species. The missing habitat also effectively eliminates the dhole’s natural prey, which include buffalo, deer, goats, and wild pigs. With nowhere to go and nothing to eat, survival becomes much more of a struggle. 40) As their prey populations dwindle, wild Indian dogs are forced to look for other sources of food. This puts them in direct conflict with farmers, who actively try to kill the offenders (despite the fact that it has been illegal to kill dholes since the 1970s). One common method of dealing with wild dogs is to poison the carcasses of dead animals, so that scavenging dholes die, too. 41) The wild dogs of Asia have also been infected and affected by diseases introduced through domesticated animals, particularly cats and dogs. These maladies have had a truly detrimental effect on dhole population numbers. 42) Because there are only 2,000 to 2,500 dholes left in the wild, spread across a dozen Asian countries, they’re rarely seen and relatively little is known about them. Fortunately, there are number of NGOs that are working to ensure a brighter future for these endangered Indian dogs. 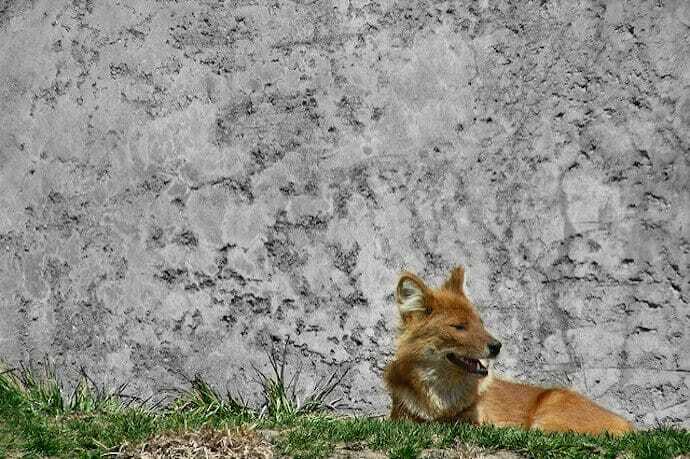 43) Ambika Khatiwada has done research on dholes in conjunction with the National Trust for Nature Conservancy (Nepal). He worked in the Kanchenjunga Conservation Area, where the wild dogs are known to have conflict with humans via livestock predations. He notes that they are one of the “least studied social carnivores in the world”. 44) In Salak Pra Wildlife Sanctuary of Thailand– which is better known for its conservation work on behalf of tigers– there was a study of the prey and habitat that dholes prefer. They fed mostly on sambar deer, and the habitat they veered towards was in the central part of the sanctuary. 45) Conservation India works with the wild dogs of India’s Western Ghats, the mountains that run parallel to the west coast of the Indian peninsula. The NGO is focused on studying where dholes live and how they use that habitat, noting what influences might be integral to their conservation. Though the dogs prefer forest habitats, studies show that developmental expansion puts them in close proximity to humans and (diseased) domesticated animals. 46) Located in the Seethakonda Reserved Forest, Indira Gandhi Zoological Park is working with breeding Asiatic wild dogs in captivity in the hopes of reintroducing them into the wild. They started with five rescued dholes in 2007 and had grown their numbers to 29 as of 2014. 47) Researchers from the Wildlife Institute of India patiently tracked dholes for 10 days in order to put a collar on one in an effort to learn more about their movements. They notes that the Indian dogs are just as ecologically important as tigers in terms of keeping the native ecosystems healthy. They also recognized the need for up-to-date information to guide dhole conservation in Asia. 48) Habitat ID visits protected areas that aren’t being looked after very well, then set up camera traps to prove the presence of specific endangered species in the area. They have verified the existence of many animals, including the dhole, in Cambodia’s Virachey National Park. 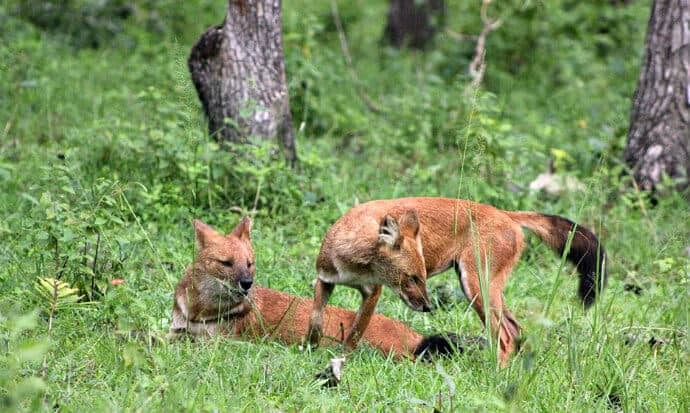 49) World Wildlife Fund has also aided the conservation of dholes in Cambodia via the WWF Cambodia AREAS project. They have focused their work in the Srepok River Area, Lower Mekong Dry Forests Ecoregion, and Eastern Plains Landscape, creating protected zones to shield Asian wild dogs from domestic dogs spreading disease such as canine distemper. 50) The San Diego Zoo Safari Park describes the dhole as a “highly elusive and skilled jumper,” and note that these animals fit neatly in neither the wolf nor fox subfamilies. They have been working with Asian wild dogs since the early 2000s. Theirs have bred multiple times in captivity, including 10 newborn pups in 2016 alone. The total number of dholes in the park now is now at 29. Whether it’s an unusual animal like the markhor or a more familiar animal such as the dhole, every endangered species in India serves a purpose in its ecosystem. With each species we lose, the planet slips a little farther into a tailspin of valuing human convenience, industry, and economy over what makes Earth a truly fascinating place to live. It’s the only planet we know of with life, so to lose any of that to extinction just seems like a tragedy. As fellow pieces in our world’s jigsaw puzzle, all of us should take a vested interest in saving the other species that complete the picture as a whole. Every animal fits into an ecological sequence, fills a biological niche that keeps other animals from starving, or controls the population of other animals or plants to keep things from getting out of balance. From a regional perspective, these roles are incredibly vital. Look at the history of Yellowstone National Park and you can see how removing an apex predator (grey wolves) created a domino effect that created huge issues for the ecosystem. From a global standpoint, as more and more ecosystems become compromised, we get closer and closer to serious consequences for all of humanity. Scientists say the dhole plays a vital role in the ecosystems they currently inhabit. These endangered wild dogs may not be as well known as tigers or snow leopards, but from an environmental standpoint they’re equally important. Without them, forest systems in Asia could collapse. And the repercussions of that are something we cannot accurately predict. But thanks to these 50 fascinating facts about dholes, we know why these Asian wild dogs deserve our protection. We know they they are unique, even among canine species. We know they live in clans with strong social ties. We know that they work as a team, and have been doing so since before humans grew their first wheat or fattened their first calf. How many Dholes are left?